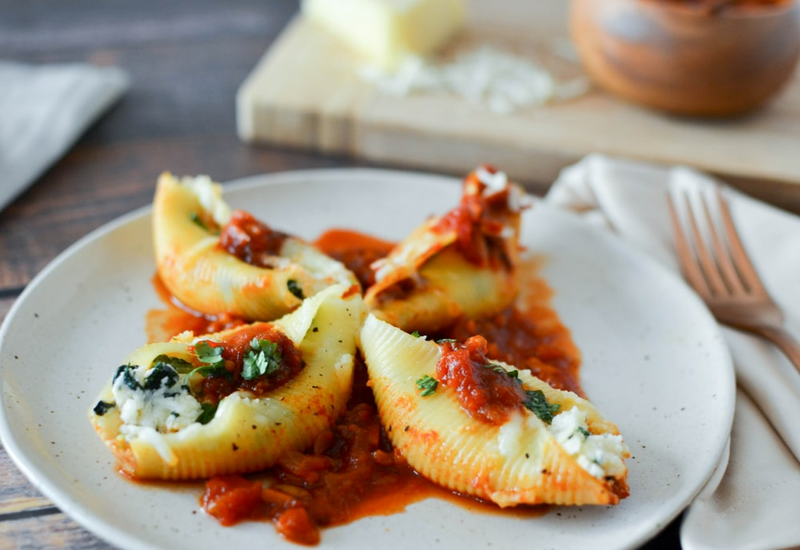 These jumbo pasta shells are stuffed with spinach and cheese and coated in a flavorful tomato sauce. The tomato sauce would normally need to sit on the stovetop for hours to develop the most flavor. However, this sauce is made entirely in the pressure cooker! It is a crowd-pleasing vegetarian dish is the ultimate comfort dinner and easy to make. Sunday supper will never be the same once you try this recipe! Mince onion, carrot, and garlic in a food processor. Heat 2 tablespoons olive oil in a pressure cooker set to Sauté. Cook and stir minced vegetables until softened, about 5 minutes; add crushed tomatoes and stir. Seal lid on pressure cooker and cook on High Pressure for 45 minutes. Relieve pressure naturally. Stir remaining olive oil into the sauce. Bring 4 quarts salted water to a boil in a large pot. Cook pasta shells at a boil until pliable, 12 to 13 minutes; drain. Preheat oven to 375°F (190°C). Lightly grease a 13x9-inch baking dish with olive oil. Pulse ricotta cheese and cottage cheese in a food processor until smooth; transfer to a large mixing bowl. Stir spinach, Asiago cheese, Parmesan cheese, chives, and parsley into the cheese mixture; season with salt and pepper. Spoon 1 tablespoon of the mixture into each shell. Pour 4 cups tomato sauce into the bottom of the baking dish. Arrange the stuffed shells into the baking dish with seam-sides down. Sprinkle mozzarella cheese over the shells. Cover baking dish with aluminum foil. Bake in preheated oven for 30 minutes. Remove foil and continue cooking until sauce begins to bubble, about 5 minutes more. Plate stuffed shells and spoon tomato sauce over them. The Italian name for jumbo pasta shells is "conchiglioni" meaning “conch shells.” You could also use tubes of manicotti as well. Per Serving: 496 calories; 24g fat; 45.6g carbohydrates; 27g protein; 40mg cholesterol; 1052mg sodium. These were pretty good. I've never had stuffed shells like this before, I'm usually a ravioli kind of guy. I liked these though and will make them again. These were superb! Slightly labor intensive but worth all of the work! It really reminds me of a dish I would eat at a nice Italian restaurant. Perfect for date nights or weeknights! These stuffed shells were pretty good. The kids weren’t huge fans of the ricotta but I remedies that by adding some extra mozzarella and sauce on top for them. I have a serious obsession with pasta so this dish is at the top of my favorites list. To change it up a little bit I added some pulled pan seared chicken into the cheese stuffing before adding to shells. I ended up having to make a second batch because there we no leftovers.